It is HOT here in Southern California. I live in a Coastal area and it is HOT, so I know it is hot, hot, hot out there. It was so hot that when I got up to take the dogs out for a quick walk this morning, 3 of the 4 opted out. They just laid where they were and looked at me. Considering that normally when I get close to where the leashes are they go crazy, I realized that the heat really gets to them. I started thinking about all the warnings you see about keeping your dogs cool, making sure they have water, making sure they have shade…and I couldn't help but think about some of the dogs out there who, on a normal day get the bare minimum they need to survive, let alone thrive. How are they fairing today? As I wet down my dogs and put ice cubes in their water dishes for the third time today, I worried about the dogs out there. I think MOST people know that you cannot leave your dog in the car when it is hot…but what about the dogs who live in the yard? Did you know that the temperature on a slab of cement can get so hot in the sun it can actually burn a dogs feet? I mean like, blisters burn! And asphalt is worse. So bring your dogs in, and only walk early in the morning or later in the evening. Did you know that dogs can die from overheating in a garage? 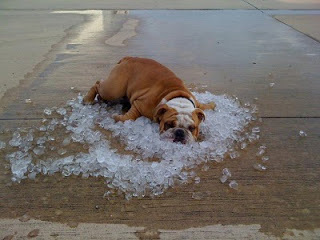 A garage can get so hot that even with water available, dogs can die from overheating in a very short period of time. Can you imagine? How horrible. Locking a dog in a garage in the heat can be as deadly as a hot car. Bring them inside. 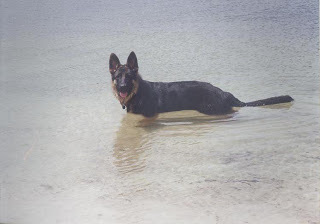 So add GSROC to the list of people sending out warnings about protecting your four footed babies from the heat. Give them extra water, extra shade, and remember… you are responsible for their lives AND their comfort.